Ask any baby boomer who grew up in the Philadelphia area in the 1950’s and 1960’s if they remember Sally Starr’s “Popeye Theater” show, and you’ll get an immediate affirmative answer. I truly think there wasn’t a child in our region who didn’t religiously watch the show unless his or her family didn’t own a TV. Sally was a local superstar with a huge fan base. She introduced us fifties kids to Popeye, the Three Stooges, and Clutch Cargo, that animated series in which the characters had weird, human mouths. And in an era when cowboys were king and almost every child, male or female, had six shooters and cowboy hats, she was a genuine cowgirl, dressed to the nines in a shirt and skirt trimmed with fringe, her blonde hair usually pulled back into a ponytail and topped with a white Western hat. I think what made Sally Starr so popular, however, was her warm personality. We kids could tell that she genuinely liked us. As happens to most performers, Sally’s show was eventually cancelled in the early 1970’s and she ended up moving to Florida. However, as soon as she returned to the Delaware Valley, she was warmly embraced by the public who never stopped loving her. All through her sixties, seventies, and into her eighties, Sally made lots of personal appearances. Though I never saw her in person as a child, I saw her a couple of times as an adult, and she was just as warm and lovely and gracious as I expected her to be. I collected an autographed photo from her each time. 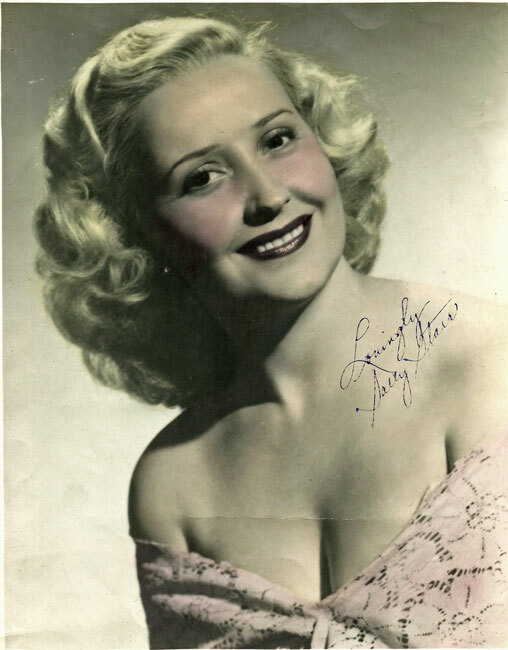 I suspect that thousands of those autographed photos are out there in drawers and boxes in baby boomers’ homes, so, as a general rule, I don’t believe that a Sally Starr autograph is ever going to be extremely valuable. That said, as soon as I saw the following autographed photo of Sally for sale at a local flea market last summer, I had to have it. Sally Starr was a beautiful woman, and this photo proves it. I believe it dates to the mid to late 1940’s when she would have been in her mid-twenties and her career in the Philadelphia area was taking off. For those of us who never saw her without her cowgirl outfit, it’s a little disconcerting but sort of fun to see her in a low-cut, lacy (racy?) number like this. 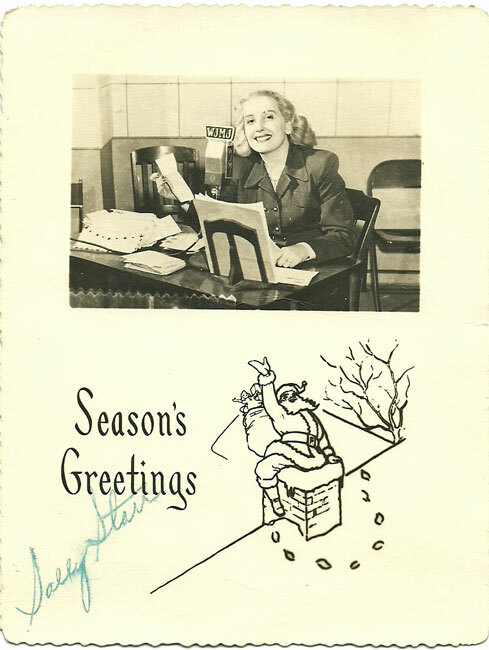 In the same box was this Christmas card that Sally probably sent out sometime in the late forties or early fifties when she was a pioneering female disc jockey. I love Christmas ephemera, so I had to have this, too. I put the Christmas card out on display this past Christmas, never thinking it would be Sally’s last. She passed away on January 27, two days after her 90th birthday. When I heard the news, all I could say was, “Noooo!” It felt like a door had shut on a little room in my childhood. If you want to learn more about Sally Starr, she has an entry on Wikipedia or you can follow this link here to her obituary in the Philadelphia Inquirer. This entry was posted in 1940's, 1950's, Carol, Christmas, Ephemera, Uncategorized. Bookmark the permalink.